If you’re looking to tie one on with a Bonefish, Permit, or Snook, your traditional freshwater fly reel is not gonna cut it! You’re going to need something with a little more backbone! However, with so many saltwater fly reels to choose from, how do you know if you’re getting a good value for your money? Lucky for you, we’ve done the research for you and have included a list of what we believe are 5 of the best saltwater fly reels for the money. When it comes to overall quality and performance, we think that the Orvis Hydros SI and the Lamson Guru 3 are the best fly reels on our list, however, the Piscifun is without a doubt the best saltwater fly reel for the money. Regardless of which one you choose, you can be sure that you’re getting a good quality reel. Keep in mind that although a saltwater fly reel can withstand the damaging effects of saltwater, it’s still extremely important that you take care of and properly maintain your reels. One of the most important things that you can do is wipe your reel down with fresh water after each and every use! Coming in at number three on our list is the Piscifun Platte fly reel. Although it didn’t snag our top spot, it’s still our pick for the best saltwater fly reel for the money. For a reel that comes in at under $200, you can’t go wrong. 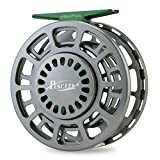 While we love the fact that the Piscifun is made out of a super strong, high-grade CNC anodized aluminum, the thing that we like most about this fly reel is that it’s fully sealed drag system. The going price of Fully Sealed Drag Fly Reel is over $300. This fully sealed carbon-to-stainless drag is extremely smooth, consistent, and will stop most fish on a dime. Impervious to saltwater, dirt, and grit, the Platte drag system is virtually maintenance free. However, as I do with any reel that I use for saltwater fishing, I highly recommend that you still rinse it off with fresh water after each use. Like with most fly reels that are made for saltwater, the Piscifun Platte sports a large arbor, which is a must for saltwater fishing. 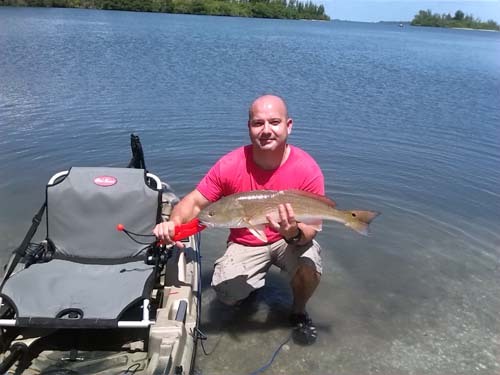 It can really give you an edge when reeling in more powerful fish such as Tarpon and big Bull Reds. Another feature that comes with the Piscifun fly reel is its easy conversion from left to right-hand retrieve. This can really is a huge plus, as some fly reels don’t come with this option. The Platte comes in 3 different colors and 4 different sizes, so choosing the one that’s right for you shouldn’t be a problem. Overall, this is a great fly reel and one that will not break your wallet either! Oh, and by the way, the Piscifun comes with a Lifetime Warranty? When it comes to fly fishing reels, Orvis is a household name and for good reason! They make quality fly reels and the Orvis Hydros SI is no exception! When I imagine what a good quality saltwater fly reel should be like, this reel immediately comes to mind. The Hydros SL is a fully machined bar stock aluminum fly reel with the same features and craftsmanship that you would expect from a more expensive fly reel. This reel has everything that we look for in a saltwater fly reel, including a super large arbor which will dramatically increase your line retrieval rate. It also has a narrow spool that helps to eliminate stacking and adds to it’s backing capacity. Armed with a fully sealed drag system, this baby is ready for battle on the saltwater flats. It’s drag also has an easy-to-use drag knob that makes adjusting the drags tension a breeze, even when fighting a fish. The drag is extremely strong and will stop most fish in their wake. While a good, strong drag is important in a saltwater fly reel, the startup inertia is more important in my opinion and the Hydros gets 5 stars in this category. In case you didn’t know, the startup inertia refers to how smoothly a reel’s drag engages once a fish tugs on your line. If your drag grabs tightly, you risk the chance of your line snapping and you losing your once-in-a-lifetime trophy fish. The Orvis Hydros is also easy on the eyes. It’s sleek, attractive design comes in two different colors and will surely complement any fly rod that you choose to put it on. Overall, this a really great fly reel for under $300. I liked this reel so much, that I really can’t think of anything bad to say. In 2009, the Guru fly reel was first introduced by Lamson and has never looked back. While it is Lamson’s lowest price reel, it’s made with the same precision and quality materials and components as their more expensive, high-end fly reels. It’s fully machined body and signature arm-style element on the frame, that combined with its open spokes, maximizes the structural strength and at the same time, minimizes weight. And just like with Lamson’s more high-end reels, the Guru features true large arbor ratios, is available in 4 weight through 10 weight, and shares identical drag design and components with the most expensive Waterworks / Lamson reels. It’s finished with a clear type 2 anodize aluminum, making this reel virtually indestructible. The Lamson Guru fly reel by Waterworks is another high-caliber fly reel that on paper, should cost much more than it actually does. 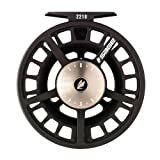 Another awesome fly reel for around $200 is the Redington Rise 3. In business for over 20 years, Redington has been dedicated to making quality, yet affordable fly reels for everyone of all skill levels. The Redington Rise 3 is a step up from its predecessor the Rise 2 and has been designed specifically for fishermen of all levels, including beginners. The first thing that you’ll notice about the new and improved Rise 3 is how much material has been removed from the body compared to the Rise 2. This new design not only makes the Rise 3 extremely lightweight, but it also makes for an extremely attractive fly reel. As with the other reels on our list, the Rise is made from a premium grade CNC machined anodized aluminum (the same material used to make airplanes), making it virtually indestructible against corrosion and regular use. It’s extra large U-Shaped arbor, means for quick line retrieval, even when battling fast running fish! This, along with the twin molded, soft-touch ergonomic handles, ensures that reeling in that prized catch will be that much easier. The Rise’s extremely smooth, compact carbon fiber drag system make reeling in even the largest catch seem like child’s play. It’s made of carbon and stainless steel friction plates, and along with 20lbs of torque, can stop most any size fish dead in its tracks. Oh, and did I mention that the drag system is also sealed? Just like with the Piscifun Platte, the Rise 3 easily converts to a left or right hand retrieve, comes with a Lifetime Warranty, and includes a handy nylon reel case. While the Redington Rise 3 may not have the same craftsmanship as the Orvis Hydros, it’s still a reel to be reckoned with and will not disappoint! Sage is not like any other fly fishing company in that they really do practice what they preach. They boast that every reel they make is hand tested and water proven and I actually believe them. These guys love to fly fish and their products, including their fly reels speak for themselves. One of their best budget-friendly fly reels is the Sage 2200 series! Giving a fish more than they bargained for, the Sage 2200 series fly reel will not let you down! Although a step down from it’s big brother – the 4200 series, the Sage 2200 will not let you down, even when battling the toughest of fish. Don’t let the price of this reel fool you! For the value conscious fishermen, this reel delivers on all fronts. Like most all saltwater fly reels, the Sage comes with a large arbor, rugged machined die-cast frame, concave spool, and whisper-smooth carbon drag, making this reel quite capable of standing its ground with any size fish. The 2200 is also easy on the hands, as it comes with a super comfortable ergonomic machined aluminum handle. It’s also easy to set the USA carbon disk drag system by simply turning the one-of-kind drag knob to the numbered setting that you want. Oh, and the Sage is also easily converted from a right-hand reel to a left handed reel. The only gripe that I have about this reel is that the drag isn’t as sensitive as others on our list. While not a huge problem, it can make fighting larger fish a little difficult, due to having to adjust and readjust the drag mid-fight. Overall though, for the price you can’t go wrong with the Sage 2200 series fly reel, which is why it rounded out our list of the best saltwater fly reels for the money. Unlike the fly reels that are used to reel in small Rainbow and Brook trout, a good saltwater reel needs to be a little beefier when it comes to its frame, drag, and line capacity. It’s also a good idea that it be fully sealed, just in case it ever accidentally goes for a swim in the water. When it comes to choosing a saltwater fly fishing reel, you want a reel that can withstand the harsh elements of the ocean, namely saltwater. The good news is that most saltwater fly reels are made of aluminum. While aluminum can corrode over time if not properly taken care of, it does not rust. As mentioned above, the other thing that you want when possible is a fully sealed body, including bearings. This will ensure that no saltwater can enter the enter workings of your reel, making it virtually indestructible. If your reel of choice is not fully sealed, then you have to make sure not to submerge it in the water. Also, for non-sealed reels, you’ll need to give them a little extra attention when it comes to cleaning after each and every use. While not always possible, the other thing that you want to try and avoid are reels that have stainless steel components such as nuts, bolts, and screws, as these will corrode fairly easy and fast. For saltwater fishing, a reel made out of anodized aluminum is essential. Anodization is a process that converts the aluminum into a decorative, durable, corrosion-resistant, anodic oxide finish. This super strong material will ensure that the reel will not bend or warp when fighting a really large fish. One of the first things that you should look at when trying to decide on a fly reel is its drag system. You want a drag that’s sealed and also a good strong drag that can stop a “freight train of a fish” from making a run and spooling your line off your reel. While there are technically two types of drags – click & paw and the disk drag, it’s the latter of the two that’s most in today’s saltwater fly reels. That’s because they offer the most resistance when fighting larger fish. The material of your drag is also important! While cork has traditionally been the material of choice, these days carbon fiber and other low-friction materials such as Rulon are what you’ll find in most modern reels. Carbon drags are for the most part maintenance-free (especially when fully sealed) and have little to no startup inertia, making for an extremely smooth drag system. When selecting a saltwater fly reel, it’s important to choose a reel with a large arbor. Unlike when you’re fishing for small trout in rivers and lakes, you’re going to have to actually reel in a Bonefish. This is where a large arbor comes in handy! It greatly increases your retrieval rate, making it a whole lot easier reeling in your prized catch. A large arbor can also save you a significant amount of time! As fly fishermen, we’re constantly stripping off long strands of line for casting only to have to reel in when fighting a fish or moving to another spot. With a large arbor, this chore becomes a lot easier. Due to today’s CNC machining technology, most saltwater fly reels are pretty light, even the cheaper models. My advice is that if you are planning on spending large amounts of time blind casting for fish, then you should opt for the lightest reel possible. If you are going to be sight fishing, then a light reel is probably not that important. How much should you spend on a good quality fly reel? I’ll leave that up to you! However, if I were a complete newbie, I wouldn’t spend any more than a couple of hundred dollars max and that’s for a rod and reel combo. The Redington Path Fly rod and reel combo is a great option for beginners. Once you get your feet wet and know that you want to stick with it, then I would suggest that you consider one of the reels on this list. My personal opinion is that there isn’t much difference in a $200 fly reel -vs- a $500 or even a $1000 fly reel. My advice is to save some money on the reel and buy a good quality fly rod instead. Now that you’ve seen a few great options, I hope that you have a little better idea of what to look for in a saltwater fly reel. While I wouldn’t consider them cheap, the fly reels that we have on our list are far cheaper than some of the models you will find. For instance, the Orvis Hydros SI and the Lamson Guru are both under $300, while the Piscifun, which we consider as the best fly fishing reel for the money is under $200. This just goes to show that the best fly reels for saltwater fishing are not necessarily the most expensive.